Members of three microenterprise subproject Proponent Groups (PGs) gratefully received goods from the Philippine Rural Development Project (PRDP) turned over by the Municipality of Bauko, Mountain Province on March 28, 2018. The PRDP handed P570,000 worth of polyethylene film and GI pipes to the Bauko Organic Practitioners Association (BOPA) of Bauko Norte, Monamon for the rehabilitation of greenhouses to enhance their organic vegetable production activities. The Project also turned over 100 heads of piglets to the Bagnen-Balintaugan Timpoyog Credit Cooperative (BaBaTiCCo) of Bagnen, Bauko to be distributed to members for their swine production and marketing project which envisions to establish a sustainable additional source of income aside from crop production which is said to be always affected by typhoons. “Dakedake ay iyaman mi ta wada nan inyalin di PRDP ya munisipyo ay otik. Ta waday mainayon isnan pagbiagan ya income mi (We are so grateful for the provision of piglets by the PRDP and the Municipal LGU. We now have additional source of income and livelihood),” said Wilson Mondata, BOD Chairperson of the BaBaTiCCo. Moreover, the Otucan Farmers Multi-purpose Cooperative (OFMPC) of Otucan, Bauko received P840,000 worth of agricultural machinery and equipment such as hand tractors and a thresher with blower for its farm mechanization service provider project for highland vegetable and rice production as well as farm equipment rental services. Ms. Brigida Langtiwan, BOD Chairperson of theOMPC expressed her gratitude for the machineries received by the cooperative. “The hand tractors and thresher will make our farming activities easier and accomplished in lesser time,” she added. Jocelyn W. Beray, Head of the Enterprise Component of the PRDP-RPCO CAR, said that the delivery is the first of two tranches. The recipient cooperatives may start implementing their projects to maximize time while completing liquidation papers and requirements that will trigger the release of the remaining inputs from the second tranche delivery to them. After the turn-over ceremony, the Bauko LGU officials together with the three subproject proponent groups and the PRDP staff gathered to review the business plans of each cooperative; and, to finalize the signing of the Investment Agreement entered into betweeen the municipality of Bauko and the cooperatives. In the same venue, Beray reminded the proponent groups that the delivery of goods is not the end of the PRDP’s involvement with them. “The projects will be monitored by the PRDP every now and then to see if your activities are done according to your business plans,” Beray explained to the proponents. 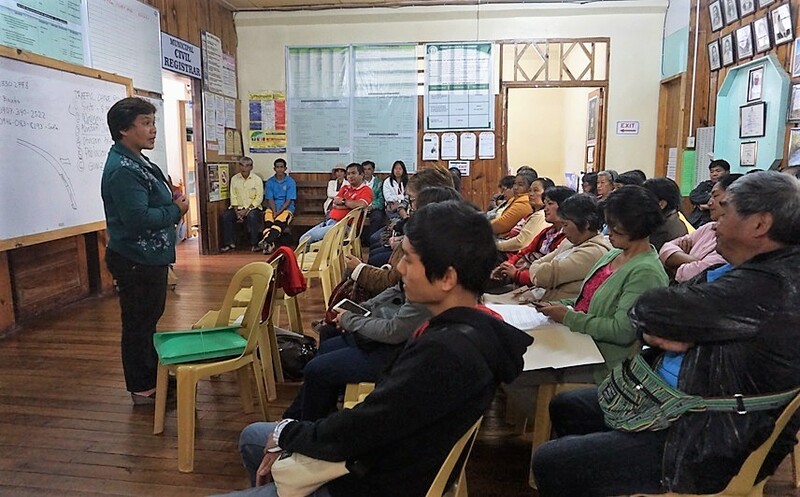 Beray added that the National Project Coordinating Office together with the regional and municipal LGU concerned staff will conduct business process reviews where activities are monitored and evaluated. She reiterated that the proponents perform the processes identified in their business plans more so on how they are going to actually run the business. This activity is part of the PRDP’s enterprise component financing modalities under small livelihood project for the financing of subprojects in calamaity-stricken and conflict-affected areas. Its target beneficiaries are small farmers and fishers who have lost productive assets. The amount of enterpise project fund provided under this scheme does not exceed one million. Bauko Municipal Agriculturist Carolyn Wandalen briefly explains the content of the Implementing Management Agreements (IMA) to the PG members.